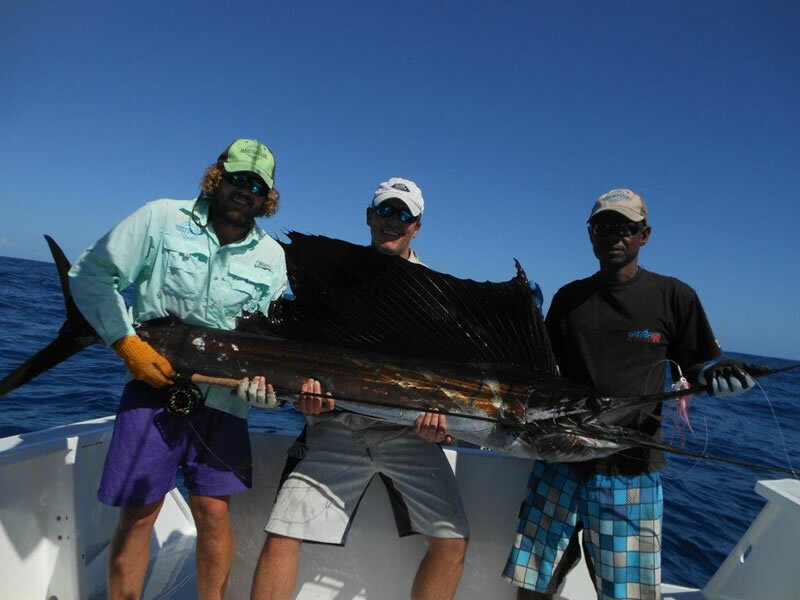 With very settled weather and a slight decrease in water temperatures, June and July have seen increased concentrations of baitfish to the North of Nosy Be and with it, the arrival of large numbers of sailfish as well as yellowfin tuna. 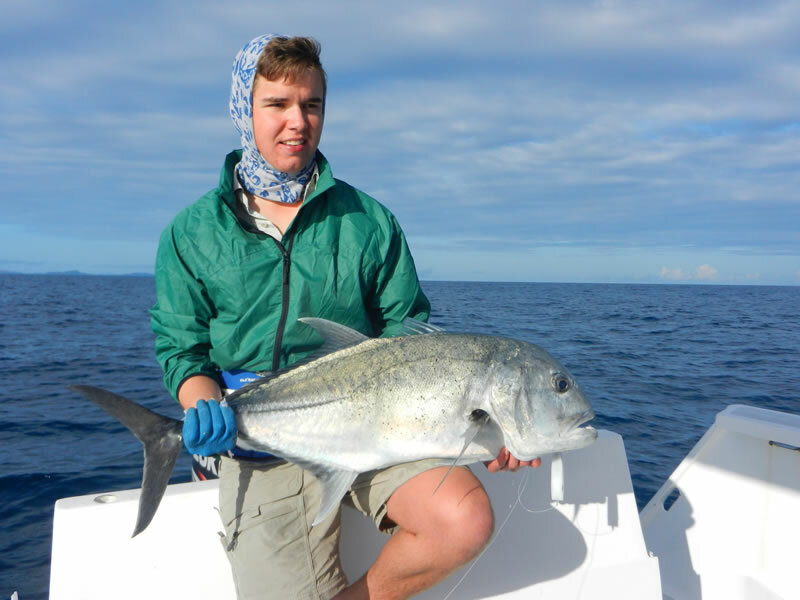 A relatively short run from Sakatia Lodge, these grounds are also rich in birdlife, and the occasional whale shark, which have been following the large schools of bonito and tuna around. Throwing large plugs and poppers around these areas of surface activity have resulted in some decent yellowfin as well as sailfish, with large numbers of follows right up to the boat. As an aside, in these situations, it is often better to slow the popper or stickbait right down and impart a more subtle action to the lure. This tends to increase ones chances of a confident eat from the sailey. Trolling hookless teasers has also been highly productive here, and those anglers who have targeted them with flies have had decent success. 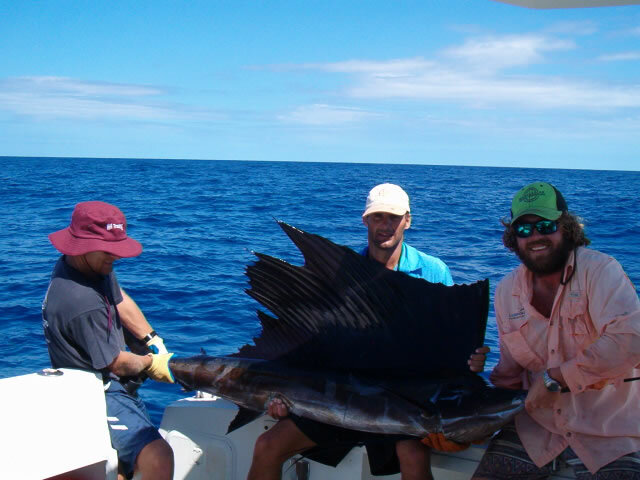 The number of free-swimming sailfish at times is astounding but extra patience is required with these fish as they are usually feeding very selectively on very small baitfish. An added bonus from our day trips to this area has been the GT fishing on the run out and back. Early morning and late evening are never really prime sailfish times but provide a perfect window for throwing lures for GT’s. 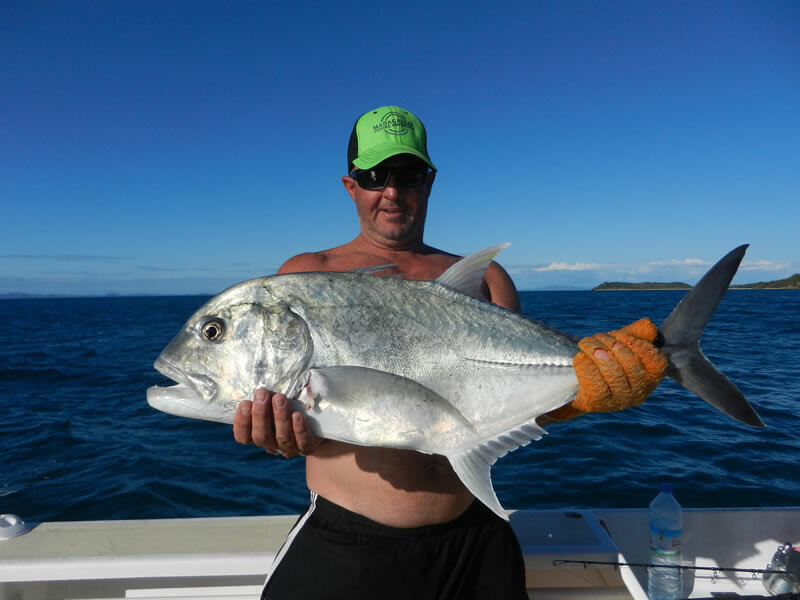 Targeting shoals of fusiliers has produced some nice fish, and fishing the northern edge of Nosy Be with its strong current in the late evenings has also been productive. 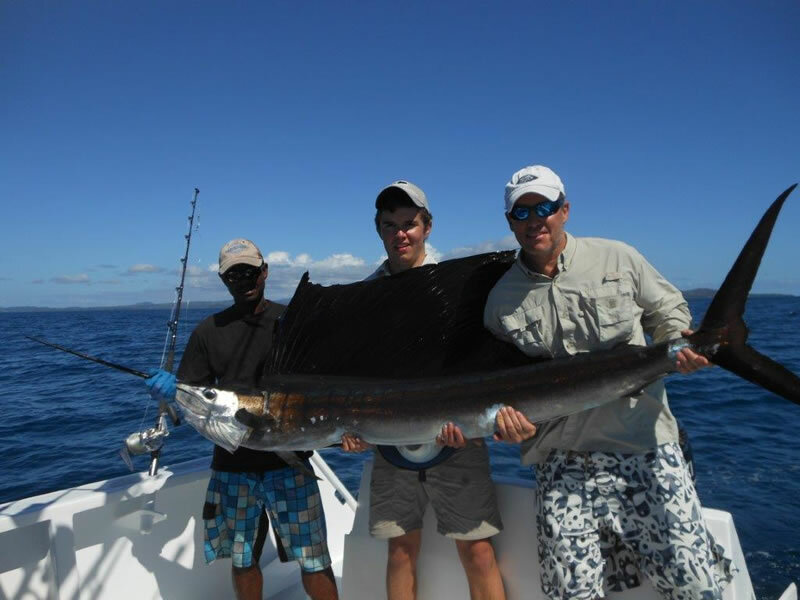 Castor continues to produce sailfish and my last trip to this area yielded some nice dorado as well as GT’s. 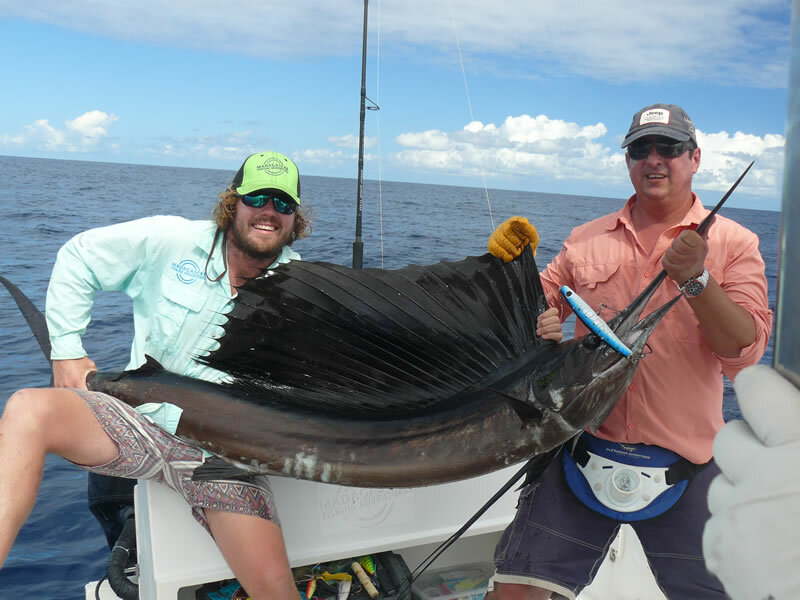 The sailfish here are incredibly aggressive at the moment and, if spotted, will charge a trolled skirt with occasional double- or even triple hook-ups. This calls for a bit of calm as three sailfish greyhounding in different directions tends to get everyone a bit excited! Jigging has been slightly quiet but should improve towards September-October. This is also a particularly good period for wahoo and these predators should start arriving en masse shortly. 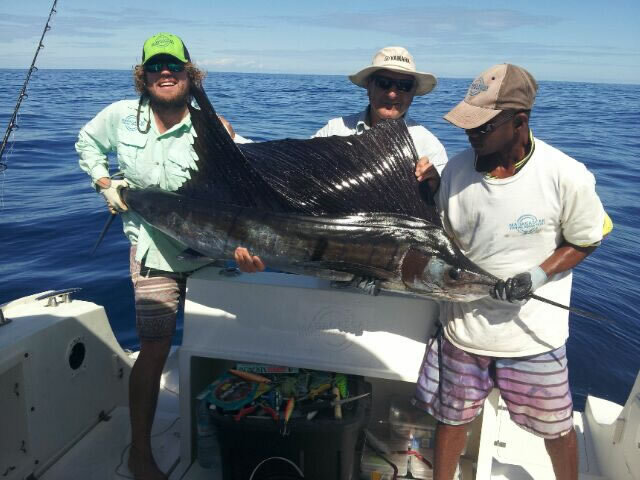 Fishing in the south around Baramahamay and Russian Bay has been decent and will improve from September onwards. 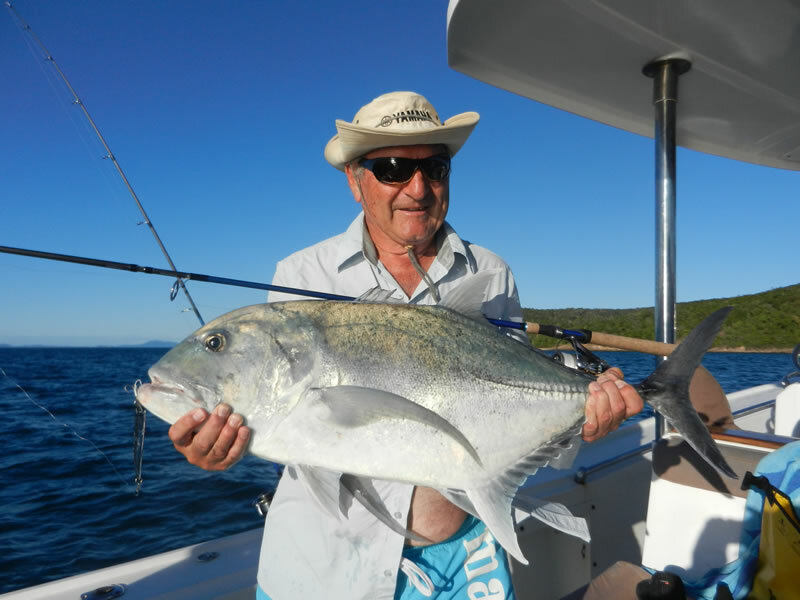 The mouth of Russian Bay has provided some good GT fishing, and Garth Grobellaar landed a very nice fish throwing a small spoon on his grunter rod! For those wanting a break from throwing heavy popping sticks, these areas are really perfect to fish, making accurate casts towards structure with lighter gear. Looking forward to seeing how the rest of the season progresses!